It’s been more than 50 years since India gained its independence. Political leaders who fought tooth and nail for their cause now had a bigger challenge in their hands; the challenge to create a new nation, brick by brick. The jubilation of freedom was followed by the pathos of a grotesque partition. Millions lost their lives in riots and transit. India’s economy stood like a ramshackled building, orphaned by the demise of an ageing caretaker. Commentators and curious watchmen christened the battered state: Post colonial India. But in the vision and ideology of few progressive Indians, it’s the nation’s history and present that baptizes it- Accidental India. Shankkar Aiyar, a prolific journalist and author, recedes into the pages of history to find out what exactly caused this mishap. 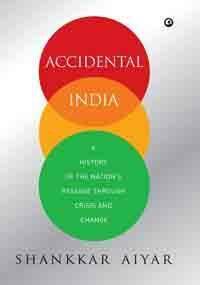 His latest book: Accidental India- History of the Nation’s Passage through Crisis and Change, offers a lucid account of Indian political system’s prolonged velleity. The crippling inability to utilize opportunities stunted India’s economic growth. Independent India bestowed its helm on the first prime minister- Jawaharlal Nehru. Denizens had no qualms about Nehru’s leadership qualities. Unfortunately, Nehru’s untrammeled vision was shrouded by staunch socialist policies. His resilience eluded him and he stayed firmly resolved in his ideals. His rigid stance on privatization erected many roadblocks. These impediments glared menacingly on India’s development till the late 90’s. Aiyar vents his anger on the last minute bureaucratic action. The political brass of the country jolts out of its slumber, when it fails to drown out the incessant screams; the screams emanated from the belly of a drastic situation. Aiyar lines up a series of prominent events; events which were backed by able minds. These innovative ideas were conceived to herald a wave of political and infrastructural changes. But, the non altruistic political machinery of India was more eager to burn the ladder. Aiyar opens up the reader’s eye to the grand fiasco of The Mid-Day Meal Scheme. In the year 1982, Tamil Nadu made a noble attempt to change a couple of staggering ground realities. Chief minister MGR’s deeply cogitated plan bore the promise of change. The plan of providing meals to school children was initially greeted by a fusillade of diatribes. But the leader refused to kowtow and he pursued his goal with dogged determination. The verdict made the detractors put their foot in their mouths. Other states were quick to follow the suit. But, the changing course of time corroded this brilliant notion too. In one of the chapters, Aiyar sets his eyes on the reviver of Indian economics. Dr. Manmohan Singh, the soft spoken face of Indian government shot to fame with his extraordinary accomplishment. He earned plaudits for his consolidated efforts that gave scrawny Indian economy a new lease of life. This book recounts the journey of liberalisation and covers the exploits of every sailor in detail. Aiyar’s commendable work of nonfiction confines a tale of frictions and fissures. It encapsulates the corridors of power where vicious gambits ceremoniously unfurl. His words shed light on one of Indira Gandhi’s classic manoeuvre. He piques the reader’s interest by dissecting the elaborate travesty of nationalising Indian banks to the last vein. It’s ludicrous yet disturbing to read through the story of Dr Guduru Venkata Chalam. This gifted scientist found himself entangled in the legal loop for allegedly possessing paddy seeds. He was simply following the instructions of the agricultural minister who assigned him the task of bringing the aforementioned seeds safely back to India. After braving a barrage of questions hurled by airport authorities, the poor scientist finally found an exit. Aiyar’s astute observation paints a rather depressing picture of reformational bootlegging. Aiyer shares a common sentiment with many other deft analysts. He makes no bones about the fact that the real villain prowls in the garb of inept governance. The nation kept on paying a heavy price for the numerous foibles, committed frequently by changing governments. Burning issues like poverty, corruption and suicides will never see a closure if this cataclysmic situation prevails. In the reviewer’s opinion, the book is nothing but a clarion call to the educated echelon of Indian society. It’s an appeal directed to the steady hands which can give this distorted lump of clay a new shape.